Even during rainfalls or severe weather conditions, radar echoes are clearly displayed, and unnecessary echoes can be removed instantly with ease. The technology for removing sea, rain and snow clutter has been greatly enhanced utilizing FURUNO’s state of the art knowledge in digital signal processing. When using the Target mode, vessels close by and vessels on intersecting courses are automatically displayed zoomed in. These targets will remain displayed for as long as they pose any concern. Target Trails are also displayed, making it easy for the user to determine the movements of individual vessels. When using the True Trail Mode, moving objects will show up on the main screen with a colorful trail. These trails make it possible to see the movement of nearby vessels in the blink of an eye. 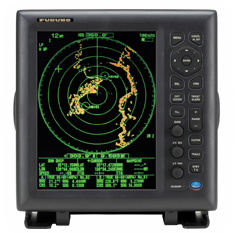 The radar echoes move smoothly on the main display thanks to the “True View Mode”. The True View Mode is based on the head-up mode. During the radar sweep, the echoes move according to the heading of your ship. Since the echoes move in real-time, the discrepancy between an observed target and what is displayed on the radar screen is greatly reduced. Converting a FR8XX5 24RPM gearbox to 48RPM: 1.) Remove 000-169-460 24RPM motor (List credit $200). 2.) Add 000-173-455 48 RPM motor. 3.) Add 100-109-985-10 Turning Gear. 4.) Add 100-264-551 Fixing Plate. 5.) Add 2 hours of labor at current labor rate.